My field of research is algebraic number theory and algebraic geometry; in particular, I am interested in the theory of modular forms and Galois representations. Given a modular form which is an eigenform for a certain algebra of Hecke operators, it is a theorem of Deligne (following work of Eichler, Shimura and Igusa, and part of the result is jointly with Serre) that one may associate to it a system of 2-dimensional Galois representations. For modular forms over totally real fields, the analogous result is due to Carayol (with other notable contributions from Ohta, Blasius, Rogawski, Tunnell, and Taylor). These representations occur in the cohomology of certain Shimura varieties. Serre conjectured a converse to Deligne's result: he suggested a criterion for the reduction of a Galois representation to come from a modular form, and even made precise guesses as to the weight and level of the form. Although Serre's criterion remains highly conjectural, it is known that if it does come from a modular form, then it comes from one of the weight and level predicted by Serre. These are due, respectively, to Edixhoven (with work by Gross, Coleman and Voloch) and Ribet (with work by Carayol, Mazur and Diamond). For totally real fields, one can make analogous conjectures, and my current work involves trying to solve the case of the weight, jointly with Kevin Buzzard and Fred Diamond. The question of the correct level seems to be more or less resolved (papers  and  below, unpublished work of Fujiwara and Rajaei, and other papers below). The results of Ribet and Edixhoven are crucial to Wiles's proof of Fermat's Last Theorem. One might hope to use analogous statements over totally real fields to deduce some similar results - what can one say, for example, about solutions to the Fermat equation over real quadratic fields? Fujiwara has proven the analogue of Wiles's result, and one might hope that the study of Galois representations associated to Hilbert modular forms might give some interesting results. Recently, these questions have begun to be the main focus of my research. With my former PhD student, Paul Meekin, who successfully gained his PhD in 2003, we have examined the methods of Ribet to deduce an implication of the form "Modularity implies Fermat" for a (very) small number of real quadratic fields (in fact, in , we show that only Q(sqrt(2)) will work!). More recently, I have worked with Jayanta Manoharmayum, to generalise some theorems on the modularity of elliptic curves over totally real fields. In particular, it looks as if we can prove the modularity of semistable elliptic curves over some real quadratic fields, and, in conjunction with the results of Paul Meekin, mentioned above, leads to the result that the Fermat equation xn+yn=zn has no non-trivial solution in Z(sqrt(2)) if n>3. I also jointly supervised Rajender Adibhatla (2005–2009) for the first year of his thesis. 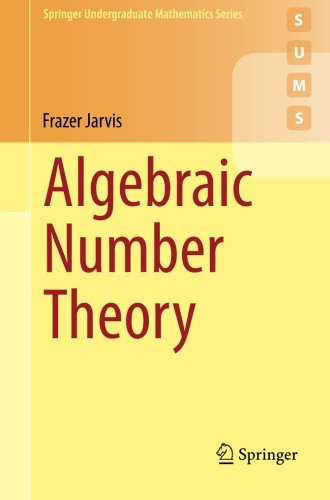 In about 2006, Springer suggested that I might like to write a book on Algebraic Number Theory for their Undergraduate Mathematics Series (SUMS). So I did, but it took me quite a long time; thanks to various Springer editors for their patience. It was eventually published in July 2014. Already, kind readers are sending suggestions for improvements, and I'll make a page dedicated to the book, containing these suggestions, in due course.